Our first e-news to members and friends of We Ride Australia has just been distributed and is a milestone for the Foundation – it marks our first 12 months of operation after our change to a charitable not-for-profit organisation. This has all been made possible thanks to the support of our Foundation Benefactors, Members and supporters. We have a lot more to talk about – our 14th Cycling Luminaries Awards – a successful Australian Bicycle Summit – a big advocacy update and more. But first to news! To build public awareness around the joy, convenience and sheer utility people experience when they ride a bicycle, We Ride Australia has launched a national competition to encourage Australians to make a short personal video to say why ‘#WeRide!’. There is a ‘how to …’ video on our website and a cool video about the competition – no expertise required thanks to our friends at bikefilms.co, just your love of riding a bike and a smart phone! Simply make and upload your short video, it’s easy! We’ll post the videos online as entries come in with judging occurring later in the year. See more here. Enter your video now to be in the running for $8,000 worth of prizes from our sponsors! From 2002 We Ride Australia has showcased the people, places and programs that get people riding a bicycle. 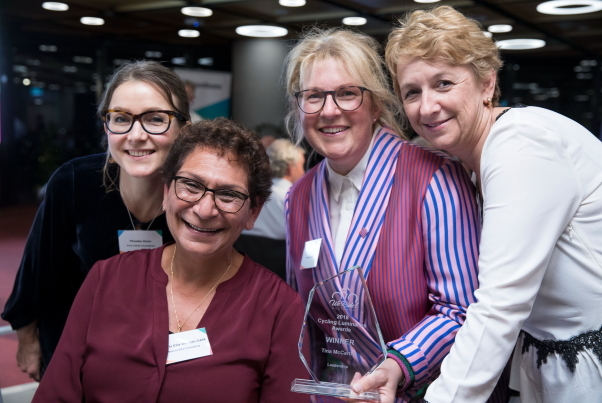 From tiny indigenous schools in the Gulf of Carpentaria, to women’s programs in Melbourne, leaders in government and professionals in corporate environments – the Awards recognise memorable stories each year. 2018 was no exception with winners in the categories of Leadership, Bike Culture and Built Environment all receiving their Awards in a Gala Dinner at Lendlease’s global headquarters in Barangaroo, Sydney. See more. Wheelwomen’s Tina McCarthy was the fabulous winner of the Leadership Award this year, but we mistakenly pasted the wrong website link into our media. Tina, we’re very sorry – especially as this mistake was then copied through the bike industry’s Trade News e-news that went out last week. Tina is currently lining up some ‘Winter Warmer’ sessions to skill her riders up in basic mechanics while the ride conditions are a little cold. These complement a host of other free programs run by Wheel Women. They’re on the lookout for some new Ride Leaders in Victoria and interstate and have started a national search – so if you know somebody who is keen, let them know! 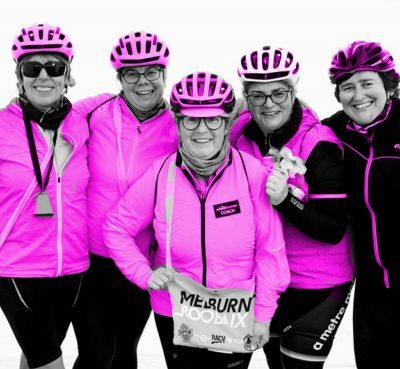 Find Tina and the team at www.wheelwomenaustralia.com. Photo: Tina and some of the Wheel Women Coaches at Melbourne Roubaix, photo by Fyxo. Supported by our Principal Partner, Transport for NSW, leaders from corporate Australia, government, Australian cycling organisations and advocates came together for a diverse Summit program that covered city planning, data, bikeshare and cycling to school. Vancouver’s Manager of Transportation Planning, Dale Bracewell, headlined the Australian Bicycle Summit this year. Demonstrating how planning for all modes has led to significant improvements in transport efficiency through increases in walking, bicycling and public transport since 1997, his presentation was a stunning example of what can be achieved in a major north American city. Not only have 2021 targets for a half of all trips from those three modes been achieved already, but between 2008 and 2011, cycling trips are up 41% and collision rates are down 17%. Transport for NSW underlined the support for active travel contained in their Future Transport 2056 Strategy. 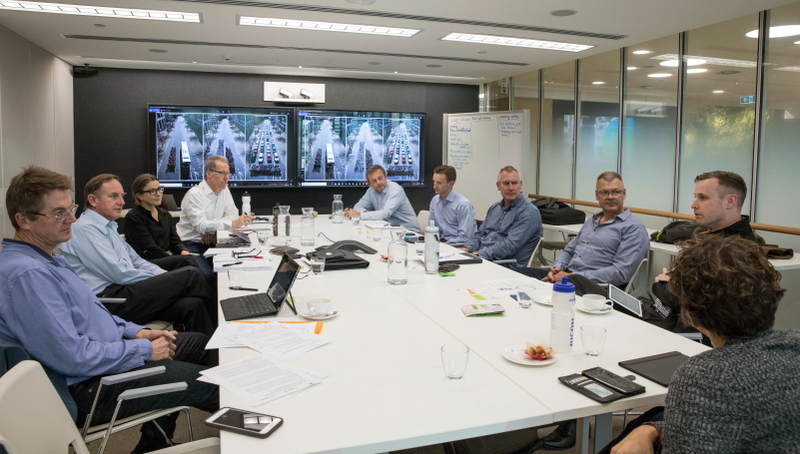 The evidence, experience and support for investment in cycling was directly conveyed from corporate Australia, experts and other OECD cities to senior TfNSW executives. The Summit was hosted by global Australian corporate Lendlease in their stunning headquarters at Barangaroo. The bicycle lobby presented a unified front in this national event with near universal participation from national, state and territory cycling organisations. The Summit is a vital national initiative that helps all of us present bicycle riding as part of the solution for a healthy, productive and liveable Australia – something that was supported by academics, corporates and city leaders at the Summit. It is now a nationally recognised platform for greater engagement with politicians and decision makers and compliments all the great work going on around the country. It couldn’t happen without the support of our colleagues across the bicycle sector – thanks to everyone! The expert presentations can all be downloaded as a PDF document here. Videos of each speaker delivering their full presentations have been captured and can also be viewed from the same page, with most becoming available as they are uploaded over coming days. 2018 AUSTRALIAN BICYCLE SUMMIT- Round table advocacy group, level 13, Tower Three, International Towers Sydney, Barangaroo, NSW, 20 June 2018. Photo: Jessica Hromas. Australian bicycle organisations developed a national consensus statement in their Summit forum to guide future sector-wide advocacy. It was announced as part of the closing session of the Summit. can enjoy riding a bike safely for transport, recreation and sport. Ray Rice, Advocacy Manager for Bicycle NSW, presented the Consensus Statement in the final Summit session on behalf of all Summit bicycle organisations and you can watch it here: https://vimeo.com/279029334. We Ride Australia has expanded its network as part of the global advocacy network after being invited to join the World Cycling Alliance (WCA). The WCA is an initiative of the European Cycling Federation and unites cycling organisations across the globe in a common purpose – to better promote the utility and benefits of greater participation in bicycling to international institutions. Read more here. 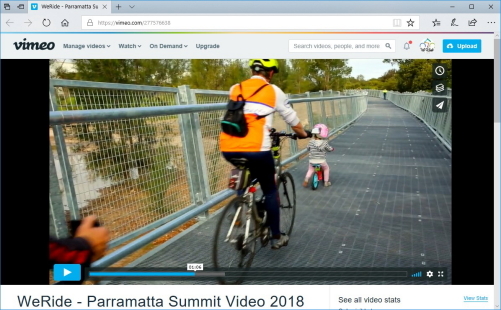 The 2018 Summit video was produced with the City of Parramatta and bikefilms.co and was a great way to kick off the Gala Awards Dinner to a full house. See it on our home page here. On 14 June We Ride Australia met with national stakeholders as part of the Cities Reference Group which is convened by the Minister for Urban Infrastructure and Cities, the Hon Paul Fletcher MP. The reference group is a key consultative body to the Minister and positions We Ride Australia alongside peak organisations nationally in a federal advisory role. Infrastructure Australia presented on planning for population growth and Prof Stanley on transit-oriented development. Strong consensus exists across the group that public and active transport is vital for maintaining liveability and productivity in Australian cities. More here. 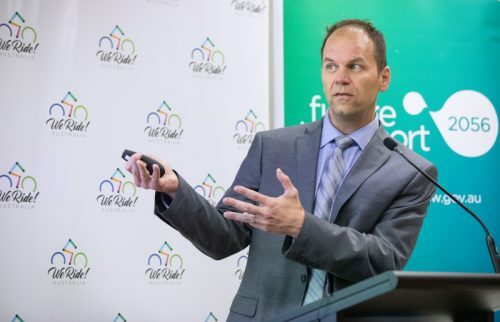 We Ride Australia is organising a Leaders’ Forum on 24 July in Perth with the support of the WA Dept of Transport and RAC featuring keynote speaker Paul Steely-White, head of Transportation Alternatives in New York. It precedes the 2018 AITPM National Traffic & Transport Conference, to be held from 24-27 July. We Ride will also facilitate the ‘Streets for people workshop’ with Paul Steely-White at the end of the conference. AITPM conference link here. Cycling and Walking Australia and New Zealand (CWANZ) is meeting in Perth on 23 July. CWANZ is the key national council with representation from every State and Territory government as well as local government and advocacy sector members. Covering strategic issues for walking and cycling, the agenda for this meeting includes: national participation survey, vision & key messages, national election position. We Ride Australia was part of the working group that helped establish the structure for CWANZ after the previous Australian Bicycle Council was disbanded in 2017. Link here. 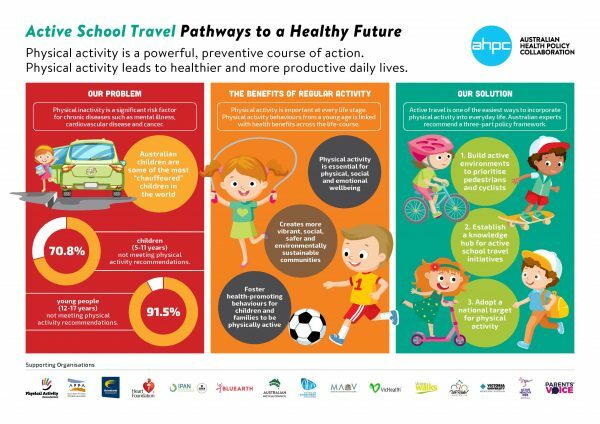 We Ride Australia helped develop the ‘Active Travel – Pathways to a Healthy Future’ active school travel policy framework. Drafted by a national collaboration of experts (Australian Health Policy Collaboration) and launched on 30 January, it makes the case for investment to get more Australian children physically active. See it here: www.vu.edu.au/australian-health-policy-collaboration/publications. 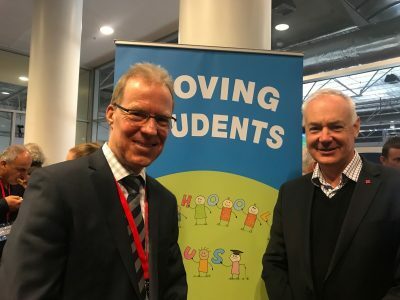 We Ride Australia was invited to jointly address the Bus Industry Confederation’s annual Summit with the Heart Foundation on health benefits of bicycling and the need to build a national Safe Routes to School scheme. The ‘National Travel to Learn and School Bus Summit’ was held on 24 June. More information can be seen here. Above: Stephen Hodge, Director – National Advocacy for WRA with Rohan Greenland, Heart Foundation. We have been asked to represent cycling and present on national cycling issues to senior Police at the 2 October meeting of the Senior Police Roads Network meeting in Sydney. Partners include ESRI Australia and the Health Research Institute at the University of Canberra as well as the Sunshine Coast Council. A successful trial will establish a national framework for adoption across all states and territories. It is designed to broaden the reach of cycling to school to a national scheme and help overcome the problems many programs experience obtaining secure long-term funding. The trial builds on the national policy framework for active travel to school – see AHPC link above. At our Australian Bicycle Summit, we thanked all of our Foundation Benefactors and Foundation Members and proudly displayed their logos. Without their crucial contributions We Ride Australia would not exist. Everything we do is ultimately working towards making riding a bike a positive, healthy and safe reality for people of all ages throughout Australia. Our Foundation Benefactor opportunity is now closed, but we’re now recruiting regular members and will always welcome more! If you’re not yet a member or would like to recommend a new member, please contact our Development Director, Phil Latz at phil(at)weride.org.au. Read more on our partners page here.